If you want to find a certain music selection in your library, you can use the Search feature. This feature allows you to search your libraries, the Amazon Store, or the web. Tap the Search button on the Options bar. Tap a tab: Libraries, Stores, or Web (see the following figure). Tap in the search field and enter the title of a piece of music or a performer. Tap Go on the onscreen keyboard. 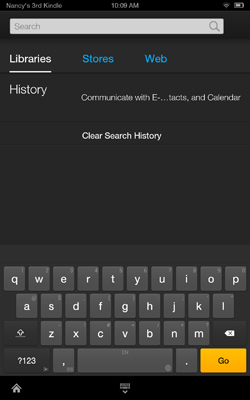 Kindle Fire HDX displays results that match the search term(s). Tap a result in Music to display music items in your library, the Music store, or the web.